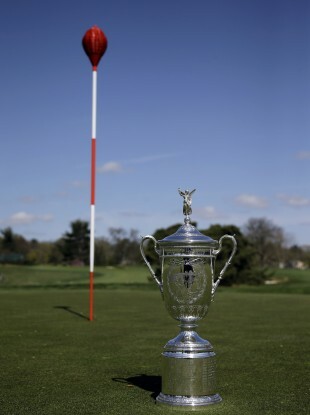 The good and the great of golf are heading to Merion GC, Philadelphia, this week for the season’s second Major. The famous wicker and the US Open trophy, won last year by Webb Simpson. DO NOT ADJUST your set: instead of shooting for the flag at the US Open, players will be aiming for wicker baskets instead. The unusual pins are one of the many traditions at Merion Golf Club, Philadelphia, which hosts its fifth US Open this week. The red and orange-topped targets are thought to date back almost 100 years after the course gained national notoriety for using them during the 1916 US Amateur. “Yes, absolutely we will be using the wickers,” USGA Executive Director Mike Davis confirmed in April. “It’s one of the many that things that give Merion its personality. So we will be using those. Though steeped in history, the wickers can make life difficult for players used to checking a fluttering flag as they try to judge wind speed and direction. It is the first time that the US Open has returned to Merion since David Graham won in 1981. Olin Dutra (1934), Ben Hogan (1950) and Lee Trevino (1971) are the others to win a Major around the Pennsylvanian course. Email “Wicker men: why this week's US Open will use 'basket pins' instead of flags”. Feedback on “Wicker men: why this week's US Open will use 'basket pins' instead of flags”.